Water consumes 71% of Earth. It is bounded by 4 tectonics plate boundaries and may include an additional plate boundary. ​Coastal currents are affected by local winds. 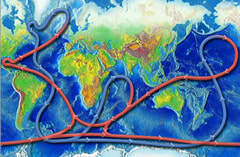 Surface ocean currents, which occur on the open ocean, are driven by a complex global wind system. If the Earth did not rotate and remained stationary, the atmosphere would circulate between the poles (high pressure areas) and the equator (a low pressure area) in a simple back-and-forth pattern. But because the Earth rotates, circulating air is deflected. Instead of circulating in a straight pattern, the air deflects toward the right in the Northern Hemisphere and toward the left in the Southern Hemisphere, resulting in curved paths. This deflection is called the Coriolis effect. It is named after the French mathematician Gaspard Gustave de Coriolis (1792-1843), who studied the transfer of energy in rotating systems like waterwheels. (Ross, 1995). The Ekman spiral, named after Swedish scientist Vagn Walfrid Ekman (1874-1954) who first theorized it in 1902, is a consequence of the Coriolis effect. When surface water molecules move by the force of the wind, they, in turn, drag deeper layers of water molecules below them. Each layer of water molecules is moved by friction from the shallower layer, and each deeper layer moves more slowly than the layer above it, until the movement ceases at a depth of about 100 meters (330 feet). Like the surface water, however, the deeper water is deflected by the Coriolis effect—to the right in the Northern Hemisphere and to the left in the Southern Hemisphere. As a result, each successively deeper layer of water moves more slowly to the right or left, creating a spiral effect. Because the deeper layers of water move more slowly than the shallower layers, they tend to “twist around” and flow opposite to the surface current. Using the next three diagrams. What pattern do they show? 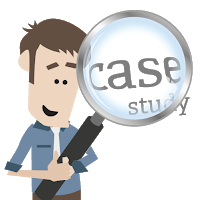 Explain the relationships of Temperature and Salinity to Depth and Location. How does this affect density? 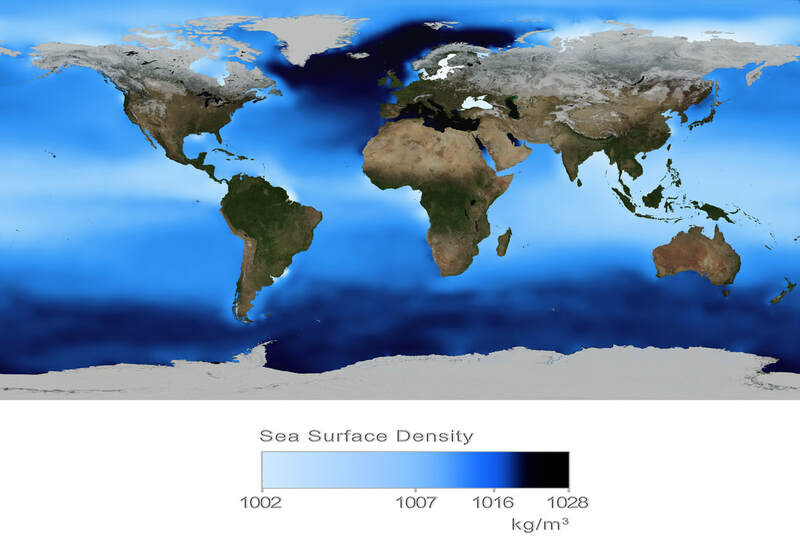 ​Salinity and density show the opposite trend to water as the depth of ocean water increases. Temperature declines with increasing depth, but salinity and water density both increase. 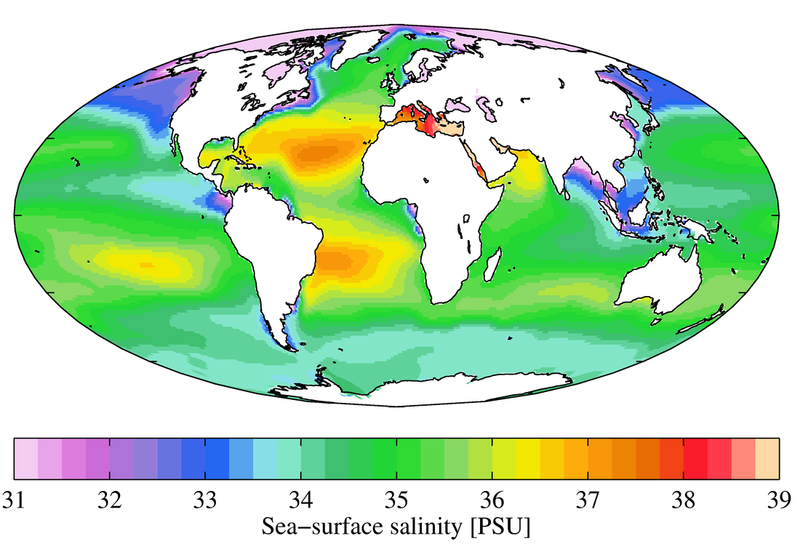 In the same way that temperature shows a rapid fall at the thermocline, salinity shows a rapid increase at about the same depth, which is referred to as the halocline. Because temperature declines as salinity increases, the net effect is to increase water density as depth increases. Because the thermocline and the halocline occur at about the same depth, the water density also increases most rapidly in the same zone, which can also be referred to as the pycnocline, which is defined the layer in the ocean where the water density increases rapidly with depth. Codrington, Stephen. 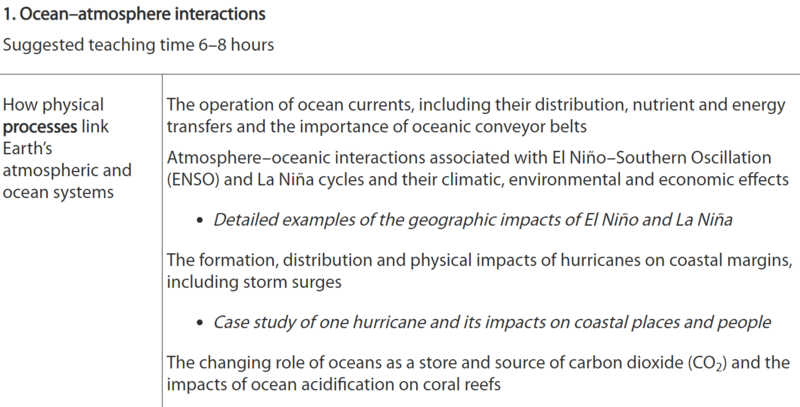 Our Planet's Oceans and Coasts (Planet Geography Book 5) . Solid Star Press. Kindle Edition. 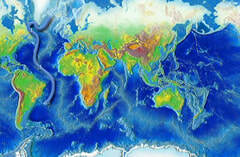 Cold, salty, dense water sinks at the Earth's northern polar region and heads south along the western Atlantic basin. 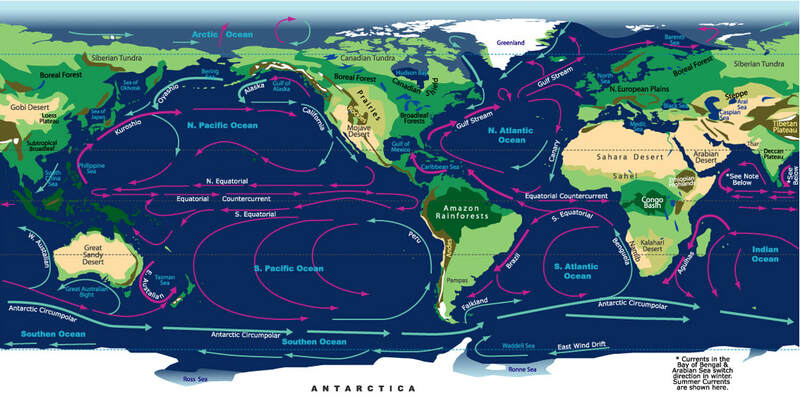 The current is "recharged" as it travels along the coast of Antarctica and picks up more cold, salty, dense water. The main current splits into two sections, one traveling northward into the Indian Ocean, while the other heads up into the western Pacific. 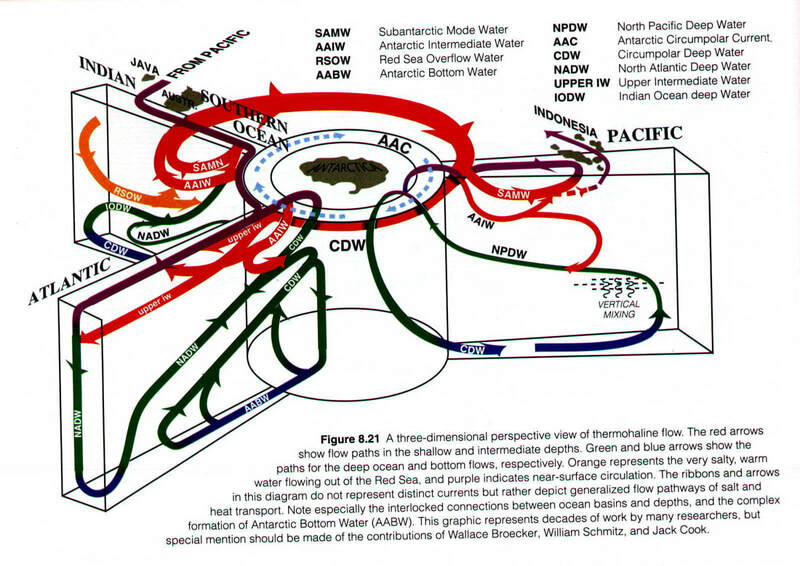 The two branches of the current warm and rise as they travel northward, then loop back around southward and westward. 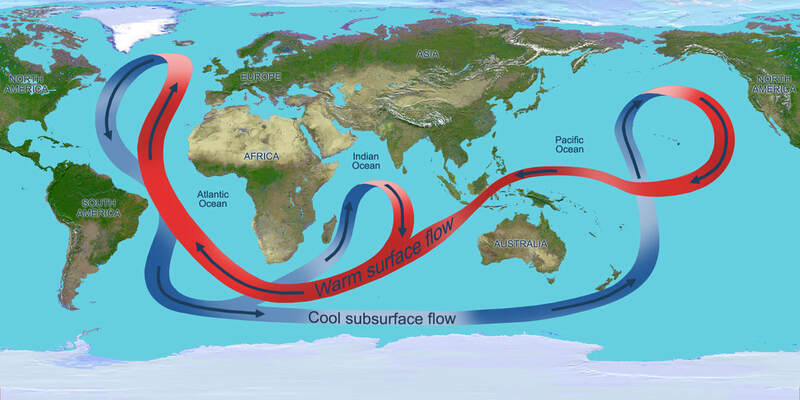 The now-warmed surface waters continue circulating around the globe. They eventually return to the North Atlantic where the cycle begins again. 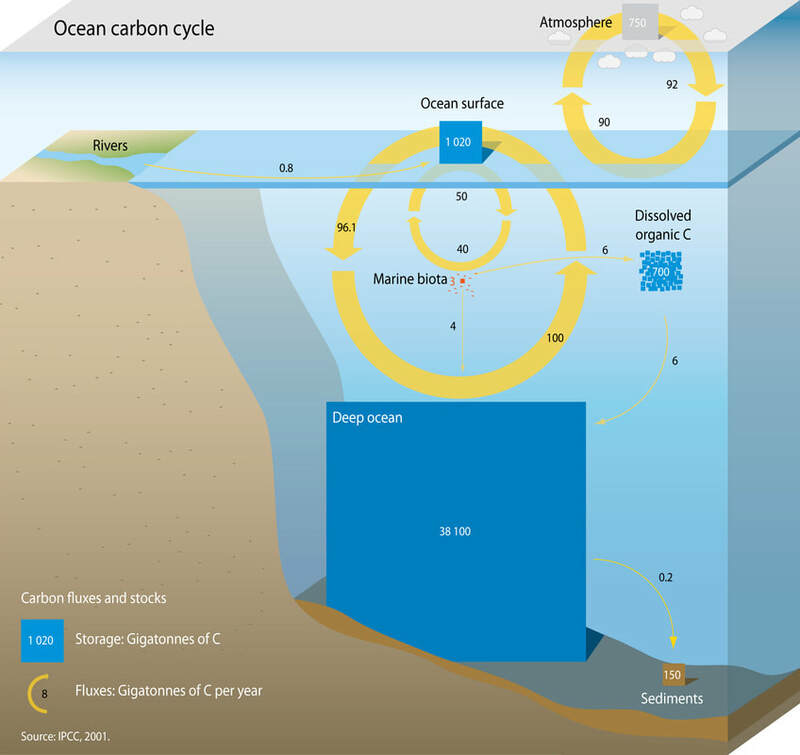 The ocean dominates the earth's carbon cycle. Half the photosynthesis (primary productivity) on earth takes place in the sunlit layers of the ocean and the ocean absorbs half of all carbon dioxide added to the atmosphere. 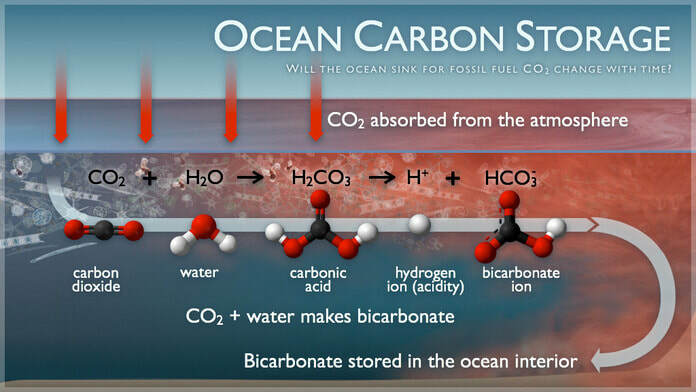 The ocean is what we call a carbon sink - actually the largest carbon sink on earth! That means it stores carbon. The amount of carbon dioxide being absorbed by the world's oceans has reduced, scientists have said.University of East Anglia researchers gauged CO2 absorption through more than 90,000 measurements from merchant ships equipped with automatic instruments. Results of their 10-year study in the North Atlantic show CO2 uptake halved between the mid-90s and 2000 to 2005. 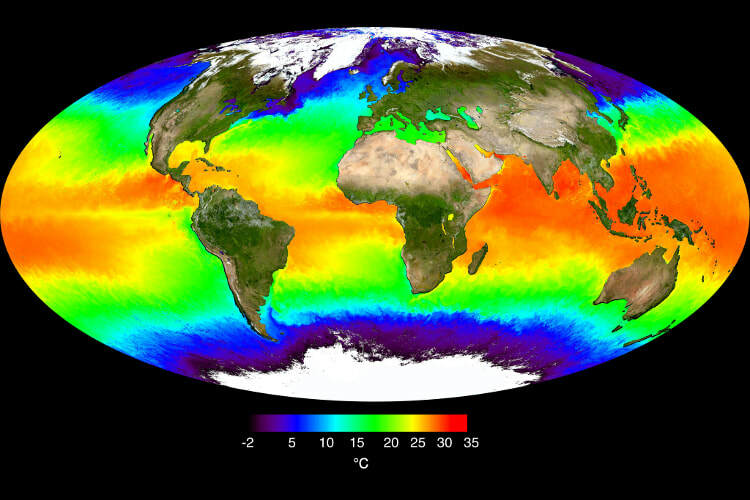 Scientists believe global warming might get worse if the oceans soak up less of the greenhouse gas. Researchers said the findings, published in a paper for the Journal of Geophysical Research, were surprising and worrying because there were grounds for believing that, in time, the ocean might become saturated with our emissions. BBC environment analyst Roger Harrabin said: "The researchers don't know if the change is due to climate change or to natural variations. 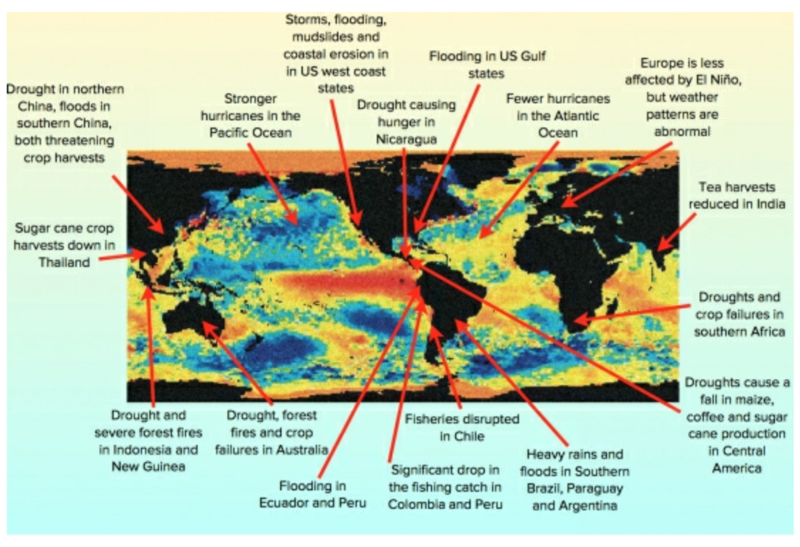 "But they say it is a tremendous surprise and very worrying because there were grounds for believing that in time the ocean might become 'saturated' with our emissions - unable to soak up any more." He said that would "leave all our emissions to warm the atmosphere". There are two major carbon sinks in the biological cycle: the oceans and the land "biosphere", which includes plants and the soil. Hurricanes: A hurricane is a large low pressure system characterised by high winds and heavy rain. 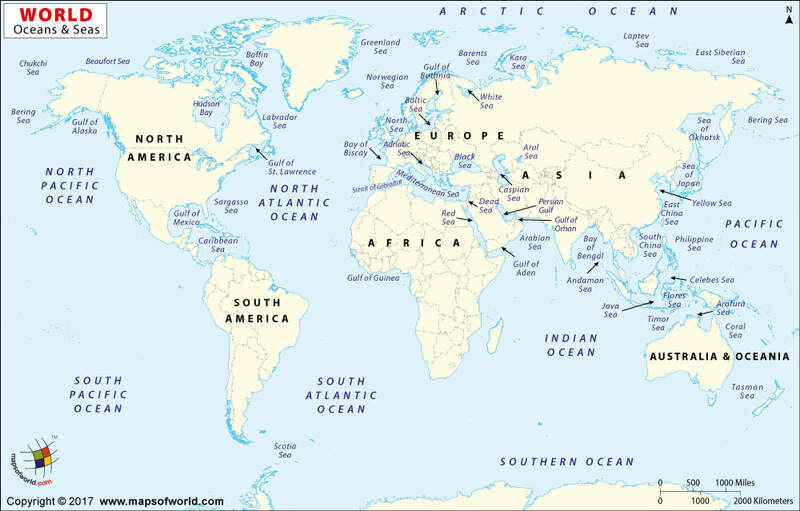 Hurricanes are also known as typhoons in East and South-east Asia and cyclones around the Indian Ocean. To be classified as a hurricane, winds must exceed 119km/hr (74 mph). Small low pressure systems are called tropical storms (63-118km/hr) and tropical depressions (0-62km/hr). 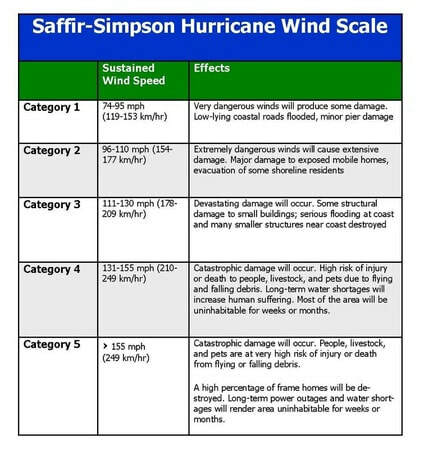 Hurricanes are normally measured by using the Saffir-Simpson Hurricane Scale developed by the National Oceanic and Atmospheric Administration. 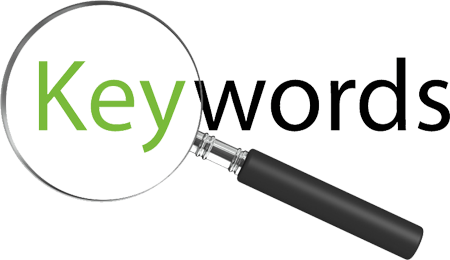 Hurricanes are measured on a scale of 1-5 depending on their wind speed and storm surge.